inscription: Printed in black under center image is "Ken Byler." One number in the date is blacked out and replaced with a handwritten "6". Poster is printed on brown paper and has a black image of a baby laying down with its arms and legs apart. 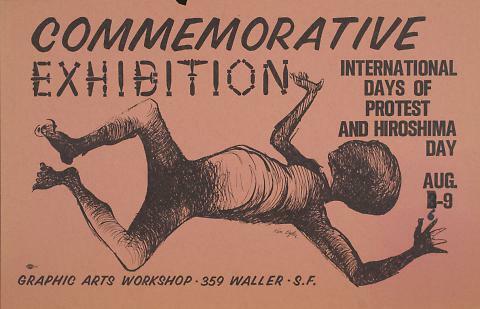 Printed above the image is "Commemorative Exhibition" in black and exhibition being spelled out in bombs and planes. On the right is "International days of protest and Hiroshima day Aug 6-9" in black lettering. The bottom edge of the poster has "Graphic Arts Workshop 359 Waller S.F." printed in black.